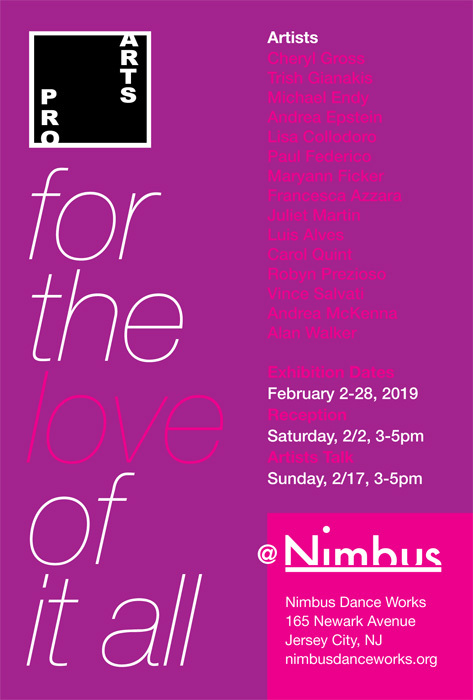 Jersey City, NJ Jan 17, 2019: For the Love of It All – a juried show of visual art that illustrates the struggle between artists and their work. Each piece will be accompanied by a written statement about the particular struggle of that piece. February is the month of love however experts tell us there is a thin line between love and hate. Artists often grapple with the dichotomy of loving and hating their work as they struggle to master their ideas and materials. Born from passion, often their best work is created in these sessions and sometimes the struggle can turn out a transitional piece that leads into a whole new body of work or can become a turning point in the artist’s practice. Pro Arts is once again partnering with Nimbus Dance Works. Pro Arts Jersey City is professional visual arts membership organization dedicated to supporting and promoting artists and their work. Please visit our website at www.proartsjerseycity.org for more information. Our programming is made possible in part by funds from the New Jersey State Council on the Arts/Department of the State, a partner agency for the National Endowment for the Arts and by Funds from the National Endowment for the arts, administered by the Hudson County Office of Cultural & Heritage Affairs, Thomas A. DeGise, County Executive, and the Board of Chosen Freeholders.